Peet’s Coffee and Tea recently added a new line of Javiva drinks that’s available in retail locations, including all of its Northern California stores in cities like Santa Cruz, Capitola, Berkeley, San Francisco, and Monterey. It also announced that it now offers Mighty Leaf Tea in its stores. 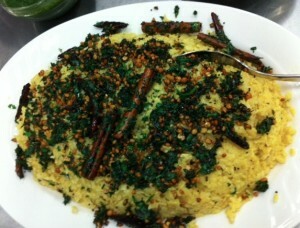 First, the details on Javiva. If you’re curious about the name Javiva, it means “coffee and life.” I had a chance to try one the other day, selecting coffee-flavored Javiva Light, and greatly enjoyed it as a refreshing afternoon pick-me-up. Javiva is one of the only made-to-order blended iced coffee drinks in the country that is made with fresh brewed coffee—specifically Peet’s Baridi Blend, comprised of East African coffees from Kenya, Tanzania, Ethiopia and Rwanda. 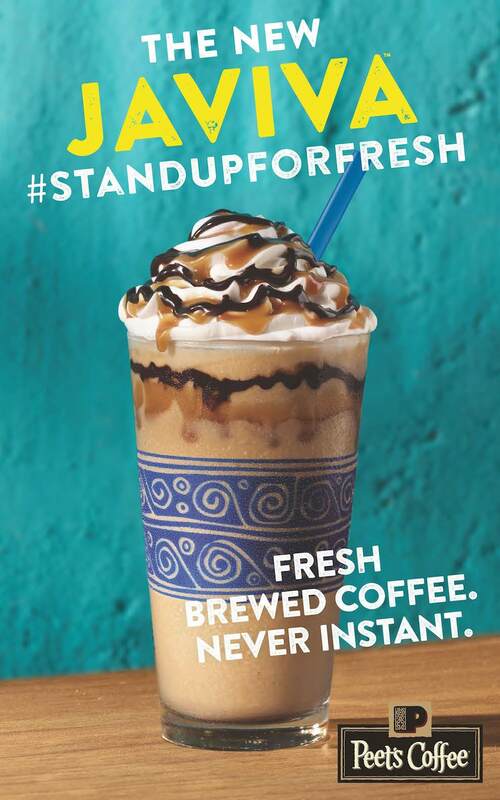 When Peet’s was working on the new product, they did extensive research over the course of a year, and found out that most of the leading blended iced coffee drinks are made with rehydrated instant coffee, packaged coffee concentrates, or coffee-flavored syrup. 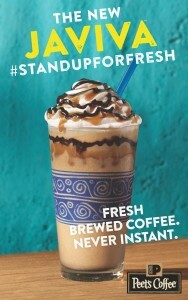 Peet’s sister company, Caribou Coffee, is an exception and also uses fresh brewed coffee in their blended iced coffee drinks. With Javiva, customers can select from several flavors (such as mocha or chocolate), and it can be made regular, light, or decaf. “Peet’s Javiva continues to be a go-to option for coffee lovers, especially as the weather warms up for spring and summer,” said Lisa Giles, Regional Manager for Peet’s Coffee. “Many of our customers love that Javiva is made with our fresh brewed coffee and is extremely customizable. You can also select from various non-dairy and even tea options,” added Giles. As with all of Peet’s beverages, if people are ordering one of the Javiva selections that include dairy, they will receive fresh, hormone-free milk. Javiva can also be made with GMO-free soy or almond milk. Next, the tea news: fans of Mighty Leaf Tea will be happy to know that they can now purchase a cup (or box) of this tea at any Peet’s location—this was just announced last month. I have loved this tea since first trying it years ago; the tea always tastes hearty and I think that’s due to Mighty Leaf’s special silken pouches filled with tea leaves. My favorite variety is Organic Breakfast. To find the Peet’s Coffee & Tea near you, use the online store locator. Are you behind on Christmas shopping? Buying for folks who are tea or coffee lovers? 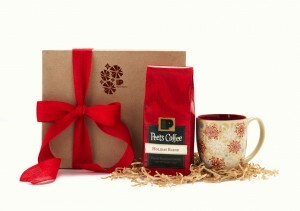 Peet’s has some fun options including special holiday packages. 1. Holiday Blend (Exquisite, Complex, Celebratory, Dark Roast): Each season, Peet’s seeks the year’s best beans to create a unique, celebratory blend. The 2014 blend is elegant, smooth, and refined with hints of dark chocolate and brown sugar, with beans from Guatemala, Ethiopia, Kenya, and Sumatra. 2. Major Dickason’s Blend (Rich, Complex, Full Bodied, Deep Roast): One of the first Peet’s blends, it’s the company’s all-time bestseller (and one of my favorites). 3. Garuda Blend (Gutsy, Earthy, Full Bodied, Deep Roast): A blend of first-rate single-origin Indo-Pacific coffees that celebrate the diverse flavors of the islands. 4. Uzuri African Blend (Beautiful, Dark Berry Notes, Deep Roast): A fully sustainable coffee that you can drink while knowing you’re helping small-scale farmers improve their lives. If you’re not interested in the exact package listed above, the 2014 Holiday Blend ($16.95/lb.) makes a great gift on its own, or as part of a gift package you design yourself. It’s also part of a few other Peet’s holiday gift packs like the Holiday Blend & Gold Stainless Logo Tumbler Gift ($35.95). Holiday teas include Holiday Breakfast Blend ($11.95/4-ounce tin, $9.95/25 tea bags), a strong black tea that features Darjeeling and other varieties, and the new Vanilla Keemun ($9.95/4-ounce tin). Peet’s is offering a special “Holiday Breakfast Blend Tea Bags Gift” ($25.95) with tea, a red holiday mug, and chocolate-covered cherries. Interested in a very decadent gift for a coffee & tea-loving friend or family member? The Peet’s Ultimate Holiday Gift ($149.95) includes one pound each of Holiday Blend coffee and Major Dickason’s Blend, Holiday Breakfast Blend Tea, an 8-cup Bodum Young press pot, a Bodum Assam teapot, two red holiday mugs, Jo’s Peppermint Bark, and Semifreddi’s Almond biscotti. Happy Holidays and Bon Appetit! 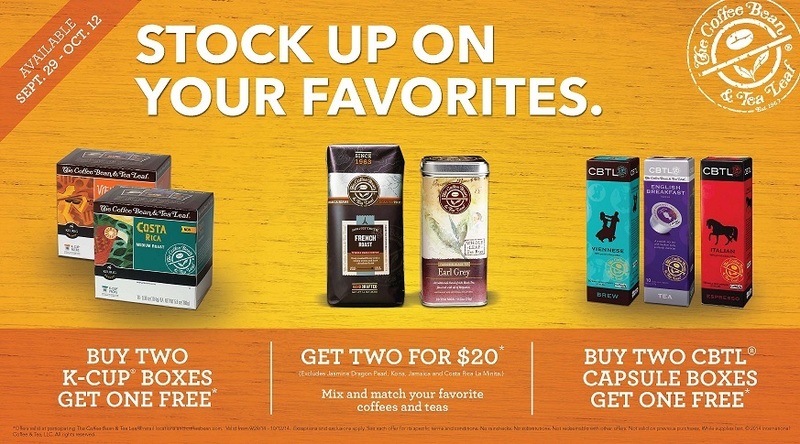 Now until October 12, 2014, The Coffee Bean & Tea Leaf’s single serve coffee boxes are “Buy 2, Get 1 Free.” Also, there are several products in their retail coffee and tea line that are on sale for “2 for $20.” Specifics for each promotion are below. Here are the details for the Buy 2 promotion: The Coffee Bean’s single serve coffee boxes include K-Cup and CBTL Capsules. If you buy two 16-count K-Cup® boxes (starting at $11.95 each), you receive a complimentary 16-count box of K-Cup® packs. The same offer applies to CBTL® Capsule Boxes (of equal or lesser value), which start at $6 each. If you’re unfamiliar with capsules, these are single servings of espresso, coffee, and tea that are brewed using The Coffee Bean’s at-home CBTL® system that’s for sale at retail locations and at coffeebean.com. Next, you can save money on the company’s signature retail coffees and teas—such as whole leaf teas, whole bean and ground coffees. If you buy one bag of whole bean or ground coffee, and one tin of tea, you get both for $20 (exclusions apply). These promotions are currently being offered at participating The Coffee Bean & Tea Leaf retail locations. To find your nearest location, visit the Coffee Bean’s store locator. Launched in 1963, The Coffee Bean & Tea Leaf is the oldest and largest privately held specialty coffee and tea retailer in the US. There are stores in more than 20 other countries, as well. Read more at coffeebean.com. 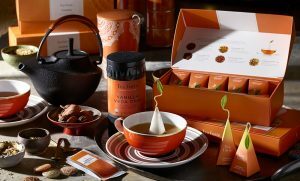 If you haven’t done all your Christmas shopping yet, and you have gift recipients who are tea or coffee lovers, Peet’s has some great ideas including special holiday packages. Holiday teas include Holiday Breakfast Blend ($11.95/tea tin, $9.95 tea bags), a strong black tea that features Darjeeling and other varieties, and the flavorful Good Hope Spice Blend ($6.95/tea bags, only available during the holidays) which includes South African honeybush, orange peel, and allspice. Peet’s uses “the best of the best” crops each year to create its holiday coffee blend. The 2013 Holiday Blend ($15.95/lb.) features beans from Indonesia, Kenya and Panama. It’s bright, rich and sweet without any one flavor overpowering another: a fabulous blend. Holiday Blend is available in Single K-Cups for the very first time this year ($13.99/box of 16). 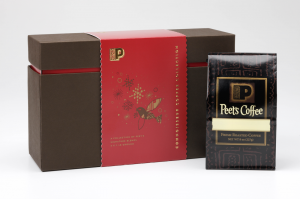 Peet’s has put together many holiday treats plus gift packages in a variety of price ranges. Some are available online only, like “A Taste of the Holidays Gift Box” ($49) with tea, coffee, and various sweets. Many items are available at stores, like peppermint bark and snowflake-decorated mugs. Below are details on two packages available online; one is quite affordable and one is a splurge for that special someone! $25 Peet’s Holiday Blend Gift Package—see photo above—includes a one-pound bag of Holiday Blend and a festive limited edition holiday mug. $250 Peet’s Ultimate Holiday Convenience Package—includes the one-touch Cuisinart single serve brewer and an array of Peet’s Single Cups including the 2013 Holiday Blend, Café Domingo® and Major Dickason’s Blend®, as well as two limited edition holiday mugs. 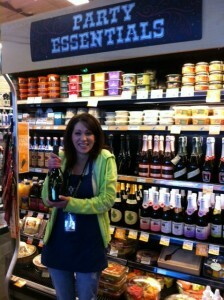 Celebrate Mother’s Day at Mom-O-Rama, being held at Whole Foods Market in Capitola and Santa Cruz. Mom-O-Rama will take place on Thursday May 9, 2013 from 10 a.m. – 1 .pm. According to Capitola Whole Foods’ Marketing Team Leader Melissa McConville, both store locations will be “celebrating all the fabulous local moms” with free 12-oz servings of coffee and tea, free makeovers in the stores’ whole body department, free mini-muffins from the bakery department, and more. Plus, the first 50 moms to attend in each location will receive a free goodie bag! Whole Foods Capitola is located at 1710 41st Avenue (across from Capitola Mall). Call (831) 464-2900 for more information. 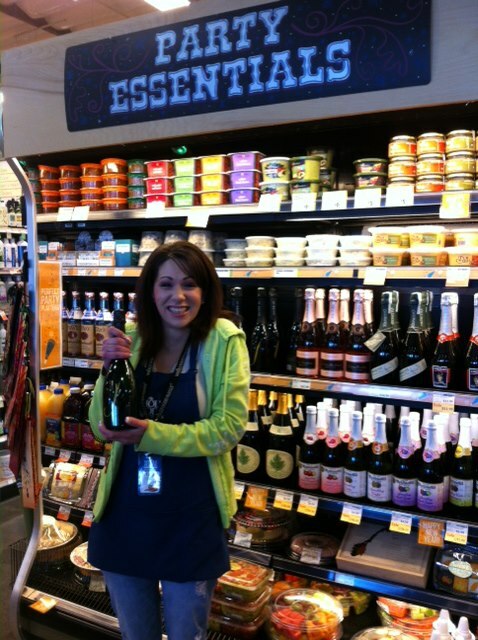 Whole Foods Santa Cruz is located at 911 Soquel Ave (in the same center as Tony & Alba’s). Call (831) 426-9901 for more information. Know someone who likes to cook? Try a Let’s Cook! gift certificate for a fun gift. The cooking school has lots of great classes, and they’re for cooks of all levels. Most classes cost $65, so that’s what the standard gift certificate costs – if your gift recipient chooses a higher or lower-priced class, details can be worked out when they call the school to register. Order online. A pound of coffee or a tin of tea, or a coffee/tea-related gift, is often a good bet for friends or family. I recently tried a few holiday offerings from Peet’s and enjoyed them greatly. The 2012 Holiday blend coffee ($16.95/lb.) is robust and flavorful. Each year, Peet’s uses “the best of the best” crops from that particular year. This year’s blend highlights coffee from Kenya. Special holiday teas include Holiday Breakfast Blend ($11.95/tea tin, $9.95 tea bags), a strong black tea that features Darjeeling and other varieties, and Good Hope Spice Blend ($6.95/tea bags) Peet’s first new herbal blend in more than 12 years (and only available during the holidays). I find Good Hope to be sweet in a balanced way; it includes South African honeybush, orange peel, and allspice. Other choices in Santa Cruz and nearby include Verve , Santa Cruz Coffee Roasting Co., and Starbucks. Kelly’s French Bakery in Westside Santa Cruz has a few selections that are good for either gifts or for adding to your holiday meal. These include Buche de Noel ($22), strawberry rhubarb pie ($21), Stollen ($16), gingerbread or chocolate loaves ($8), and cookies (sable, gingerbread, prices vary). To guarantee availability, call (831) 423-9059 by Dec. 22 at 2 p.m. to place an order. Or you can walk in and hope for the best – just be sure to visit before 2 p.m. on Dec. 24, that’s when Kelly’s closes on Christmas Eve (and it’s closed Christmas Day). Lastly, Fresh Prep Kitchens is having a holiday gift certificate sale: Buy two, get one free. They are available in $35, $50 or $100 denominations through the web site, or call (831) 435-9260. The venue provides fresh, easy-to-prepare meals and you can pick them up in Capitola, or have them delivered (for no additional fee) to your door.